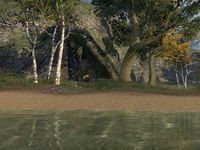 Seaview Point is a beach-side cave in Glenumbra, southwest of the Enduum ruins. A bear named Graufang resides here. Kill the giant bear, Graufang, at Seaview Point.